One of the results of assembling this column each month is that collectors and dealers periodically contact me with a “have you seen one of these?” question. Though sometimes I can say yes, it is more frequently an opportunity to learn something that I did not know. 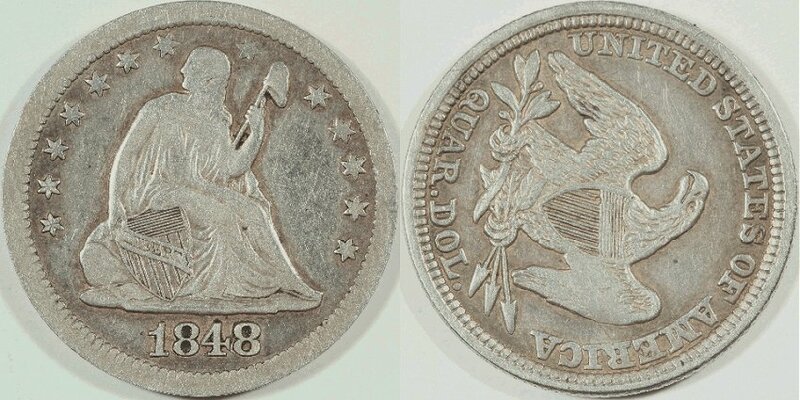 A few weeks ago I received just such an email from seated dealer Rich Uhrich inquiring about the existence of an 1848 quarter with die rotation. I was compelled to confess that I had neither seen nor heard of such a thing. Seated quarters struck from rotated dies are rare. In fact, one can just about count the number of seated quarter issues known with die rotations (greater than 20 degrees or so) on the fingers of one hand. Those that are relatively well known include: 1844-O, 1852, 1853, and 1861. I have seen examples of all these, and heard of an 1850-O with significant die rotation, but not seen it in person. A couple of back and forth emails confirmed that Rich had acquired an example of a previously unknown 1848 quarter struck from rotated dies. I met up with Rich at a Pennsylvania coin show last week and checked out the coin in person. There was no doubt as to its authenticity, but if we had had any doubts Larry Briggs (who had a table two slots up the aisle from Rich) put the last of them to rest. He also had never seen nor heard of an 1848 struck from rotated dies, confirming that Rich’s coin is, as of this writing, unique. The die rotation is about 90 degrees and, as seen in the figures, this results in some striking issues. The weak head on Liberty and the weak eagle’s wing are opposite each other due to the die rotation, most likely resulting in too large a gap between dies for the planchet to adequately “fill” the incuse areas of the die. The coin is otherwise about XF. Photos Courtesy of Rich Uhrich Rare US Coins, Inc.